Dashoguz city (Tashauz), the Dashoguz region's administrative centre, is located in northern Turkmenistan. Several historical sites and monuments are still standing. 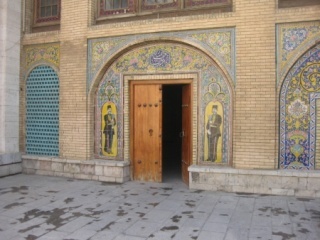 Dashoguz hosts the capital of ancient Khoresm in the city of Kenye urgench . 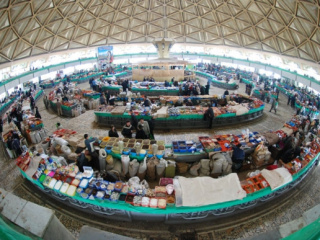 From 995 when Gurgandzh was the capital of Horezmshakh and the second-largest and important after Bukhara, this city has preserved its splendid architectural monuments. The il Arslan and Khorezmshakh Tekesh mausoleums dated from the 12th century. Significant 14th century monuments of Keneurgench are Tyurabek-khanym with a mosaic panel on the dome's inner side, considered an unparalleled masterpiece of Oriental art, and the grandiose 60-meter Kutlug-Timur, the highest in the Central Asia. Magnificent ancient fortress cities include Devkesen, Shasenem, Zmukshir, and Kenevas. In ancient times Dashoguz was important for traveling the Silk Road route for two reasons. The local authority had erected a well, later reinforced with stones to keep it clean and cool, and an oasis. Thus the city is called Dashoguz ("stone spring"). In the early 20th century, Dasoguz had a small settlement with its peculiar curved thin streets closely built up with clay one-floor houses. Many unique and rare trees have also been excavated. Only since early in the 20th century has Dashoguz begun acquiring its modern forms. Many publicly important buildings and accommodation districts were built then. The city has greatly changed over the last few years. Now it's full of fountains, cafes and restaurants. Most of the life is concentrated in one district with the bazaar and bus station near its northern end about 2 km from the town center.